Recharge and power your compatible TomTom sat nav in your vehicle using this genuine TomTom part. 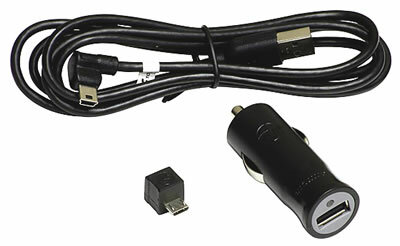 This 12/24 volt car charger features a mini and micro USB connection and is typically designed for TomTom sat navs from 2006 onwards. 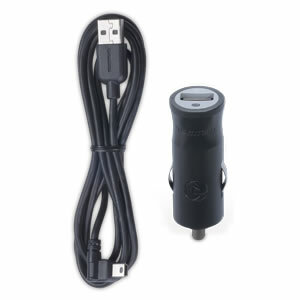 An earlier and alternative car charger with a round pin connection is designed for use with TomTom sat navs before 2006 and be viewed and purchased here. IMPORTANT: Please check compatibility with your TomTom model BEFORE buying, as when using with the GO 40 series, GO s50 series (e.g. 550, 750, 950) and 1000 series you will need to use your original device cable as well. Included in the box is a cigarette lighter adaptor, USB cable with mini USB connection and separately a mini to micro USB adaptor. Compatibility: To view a full compatibility list of TomTom products click here or scroll down to "What is the TomTom compact car charger compatible with?" Provide power to recharge your compatible TomTom sat nav's internal battery using this genuine TomTom accessory. The compact car charger is compatible with the majority of TomTom portable navigators produced since 2006, however we strongly suggest that you ensure your model is compatible BEFORE buying. In the majority of instances the micro USB adaptor isn't required as most TomTom sat nav cradles feature a mini USB port. While the mini USB connection isn't shown it is on the other end of the USB cable '1' as pictured in the image above. Please note: Some devices e.g. 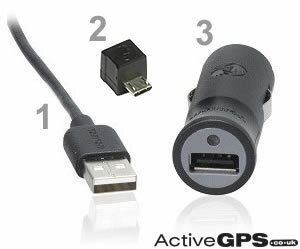 TomTom GO 950 require the use of a different USB cable. This is because the GO 950 windscreen mount doesn't feature either a mini or micro USB port. In order to power these devices via the compact car charger you must use the original cable as supplied with your sat nav. Read more and discover which models require the use of an additional cable here or scroll down to "Whatis the TomTom compact car charger compatible with?" Once you've connected and used the correct sections of cable you are then ready to power and charge your device. To provide power simply push the USB cigarette lighter adaptor '3' into your vehicles cigar lighter connector (as pictured right). The TomTom compact car charger supports both 12 volt and 24 volt. 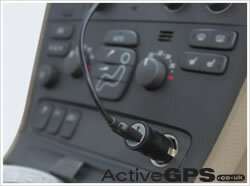 Should you have any questions regarding the TomTom vehicle power cable please contact us. What is the TomTom USB compact car charger compatible with? TomTom GO 500 (2013 model), GO 510 (2015 model), GO 610, GO 520, GO 620, GO 720, GO 920, GO 530, 630, 730, 930, GO 540, GO 740, GO 940, GO 550, GO 750, GO 950, GO 5000, GO 5100, GO 6000, GO 6100, GO 2050, GO LIVE 820, GO LIVE 825, ONE 30 Series, ONE IQ Routes Edition,	ONE New Edition (v2, v3), PRO 5150 Truck LIVE, RIDER V5 (2013), Start, Start 20, Start 25, Start 60, Start2, Trucker 5000, 6000, Via 110, Via 120, Via 125, Via 130, Via 135, Via 180, Via 220, Via LIVE 120, Via LIVE 125, XL 30 Series, XL IQ Routes Edition, XL IQ Routes Edition 2, XL IQ Routes LIVE, XXL 550, XXL IQ Routes Edition, XXL Classic. Please note: In order to connect and use the TomTom GO 540, 740 940, GO 550, 740, 950, GO 1000, 1005 and Blue & Me with the compact car charger you MUST have the original connect cable (pictured right) delivered with the device. This is because these models use a different connection than that, that is included with the compact car charger. The compact car charger includes mini and micro USB connections only. Please note: An earlier and alternative car charger with a round pin connection is designed for use with TomTom sat navs before 2006 and be viewed and purchased here. Was it another TomTom accessory or part? If it was you can view all TomTom accessories available to buy from ActiveGPS.